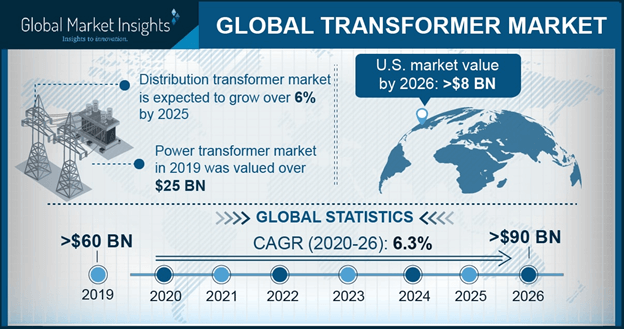 Transformer Market size for 2017 was valued over USD 50 Billion and the annual installation is anticipated to exceed 6 million units by 2024. Economic escalation in line with growing expenditure towards electric infrastructure development have fuelled the integration of effective grid systems in the recent years. Ongoing urbanization coupled with rapid commercial expansion have led to significant upsurge in demand for energy which in turn will fuel the global market growth. In addition, positive government schemes along with the restructuring of electrical grid infrastructure across established economies will further boost the business landscape. Favourable regulatory initiatives towards the development of micro-grid networks coupled with large scale sustainable energy capacity addition will augment the global market size. The industry has observed a sharp growth toward the installation of renewable energy pertaining to the sustainable energy targets borne by the nations in 2015, during the UN Climate Change Conference. Government aided incentives and policies including feed-in-tariffs and leveraging schemes will further complement the adoption of sustainable technologies which in turn will positively influence the industry dynamics. Lesser iron losses, flux leakage and effective mechanical strength will drive the closed core transformer industry size. Ongoing technological advancements along with diversified applications across the low & medium voltage installations to provide operational feasibility will enhance the product penetration. Ongoing government reforms toward rural electrification coupled with rapid urbanization across the emerging regions of Africa and Asia Pacific will further stimulate the industry growth. 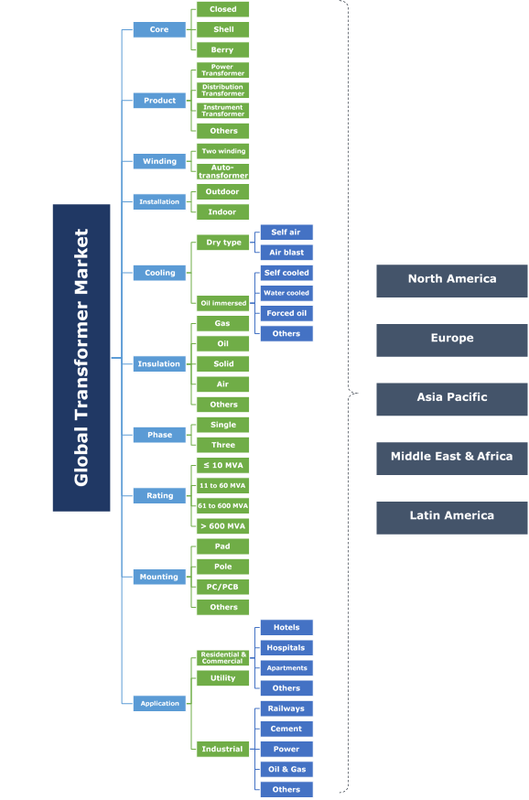 Power transformer industry in 2017, was valued over USD 20 billion. Ongoing development of manufacturing facilities pertaining to implications of economies of scale by large manufacturers will escalate the industry growth. Positive inclination toward the development of HVAC deployment to cater the electricity demand across industries along with ongoing installation of utility based HVDC infrastructure will further foster the business scenario. Ambient voltage regulation coupled with effective operational feasibility will augment the auto transformer industry share. Product compactness, higher efficiency, and low overall cost in comparison to conventional technologies are key parameters assessed to validate the product demand. Rising concerns toward energy efficiency in line with different product applications will further fuel the industry outlook. Indoor transformers are anticipated to exceed an installation of 2 million units by 2024. Growing demand for refurbishment of ageing T&D networks along with rising space constraints will positively influence the business scenario. Flourishing real estate sector pertaining to increasing public and private investments will further complement the industry dynamics. The European Commission, in 2017, invested USD 36.3 billion to ascertain effective infrastructure development across Russia. Oil immersed transformer industry size will grow on account of deployment of high voltage electric infrastructure favoured by efficient cooling property in comparison to the competitive counterparts. In the recent years, the technology has observed extensive demand owing to its optimal cooling strength, although leakage, health hazards and fire related issues associated with its installation have continually restrained the product penetration. Solid insulated transformer will witness robust growth on account of their effective cost, compact product specification and high insulating property. In addition, ongoing product diversification along with simultaneous integration of smart monitoring technologies will further drive the industry growth. Single phase, in 2017, held over 40% of the global market size. Favourable regulatory schemes to upgrade the dwindling small-scale industrial sector coupled with rapid urbanization across developing economies will thrust the product penetration. Regulatory policies including various incentives and feed-in-tariffs to encourage product acceptance across commercial & residential deployments will further positively influence the business outlook. ≤ 10 MVA transformers are projected to grow owing to high end applicability across the commercial and residential applications. Mass migration across urban areas in line with rapid urbanization across developed nations will sway the product demand. Growing demand for renewable energy mix and ongoing integration of small-scale sustainable technologies across the residential deployments will propel the industry growth. Pole mounted transformers are set to witness growth over 6% by 2024. Rapid growth of T&D networks owing to rural electrification schemes across developing nations will stimulate the product demand. Increasing investments subject to infrastructural development including railways and road networks will further embellish the industry outlook. Utility transformers in the recent years have witnessed robust product demand owing to extensively regulated electricity markets across the globe. Growing fund allocation toward the integration of sustainable technologies along with ongoing grid network expansion to serve the growing energy demand will foster the industry landscape. Although, ongoing intervention of large private market players catering across the T&D sector may impede the product demand in coming years. The U.S. market in 2017, was valued over USD 5 billion on account of growing restructuring demand of existing grid infrastructure. Ongoing technological enhancements coupled with installation of reliable grid support mechanism will energize the industry outlook. Increasing fund allocation towards infrastructural development including expansion of railway networks across the region will further escalate the business growth. Positive regulatory reforms favouring energy efficiency along with increasing adoption of smart technologies will thrust the Germany market share. Rising energy security concerns along with increasing investment toward large scale sustainable integration will further enhance the industry outlook. Furthermore, ongoing development of manufacturing facilities favoured by large scale automobile manufacturers across the country will augment the product penetration. Electrical transformer is a stationary device used to convert electrical energy across the secondary and primary circuits with mutual induction being the major operating principle. The primary function of transformer includes transfer of electricity from one circuit to another with slight variation across the power frequency or the potential difference.